From Kenneth Ellman, Email: ke@kennethellman.com. Tablet Magazine, one of the better on line Jewish news and commentary sites, (http://www.tabletmag.com/) as have other Jewish oriented publications, publish from time to time silly articles reflecting discomfort with Christian support for Israel and the Christian seeking of converts, particularly Jewish converts. I find this both humorous and distressing, sometimes also disgusting and ignorant. The humor is the utter lack of understanding of doctrines of Christianity requiring many Christian denominations to seek converts. The distressing part is that any MOT would be uncomfortable with having friends of Israel, when we need all the friends we can get. It is difficult to choose your friends as it is difficult to choose your enemies. But when someone stands with you against those who would hurt you, common sense dictates extending a hand and saying thank you. Since these people generally believe in their religion there is nothing wrong whatsoever in their championing their belief and educating others about Christianity. The Jewish objection further forgets that before Christianity, Jews were to a certain extent alone in the monotheistic world facing mostly idol worshipers and barbarians or those who believed the sun, moon, river or cats were somehow worthy to direct their prayers to. So Christianity with all its corrupt political destructiveness aside (which can occur in any human activity, even Judaism), was a great step forward for Jews and humanity in the sense that Jews now were not alone in worshiping G-D. It did not hurt that the Christians adopted a Jewish prophet as their mentor and bridge to G-D. A little strange but not really unusual in human history. Considering that MOT have made the same mistake over history, why should Christians be immune?! Many Christian denominations have a common thread in recent and current history of viewing the rebirth of the Jewish Nation of Israel as being evidence of their own Christian religion coming to fruition. Yet some MOT denounce these wonderful Christian people who love our Israel and even wish to distance ourselves from them. How truly bizarre to treat our Christian brothers in this manner. This is particularly so when it comes to what is called “Messianic Christianity” or the overt attempt to convert Jews to Christianity. I can only laugh at the secular oriented Jews who observe little or nothing looking with disdain upon such movements of Messianic Jews or evangelical Christianity of the Liberty Baptist College type. At least they seem to care about our Torah and think it is real. Something a few MOT need to relearn. As regards observant Jews who also have distaste for those Messianic Christian or “Jew Converters” they should certainly know better. There is one reason and one reason only why a Jew would seek the comfort of Christianity. That is simply because we as MOT have failed our fellow Jew. We have failed to educate and bring him into the wonderful and warm community of our people and the extraordinary literature that has possessed us and protected us for all of our time as a people. In reference to your article about former President George W. Bush participating in a Messianic Jewish Organization; i.e Christian organization, the comments here are way off the mark. We as MOT should be grateful that Christians have such a deep concern for our nation Israel. These people stand with us when Israel is threatened and are firm believers in the right of the Jewish people to have their own country. They are some of the best friends we can have and their support for Israel exceeds that of some MOT. Such Messianic Christians are NOT a threat to the Jewish people. The threat to our people comes from our own failure to educate and hold our community together. The old saying that if you have three Jews you will have four Synagogues is all too true. So often I meet fellow Jews who have little understanding of our own faith, little reading in Chumash and frequently no reading in Talmud. Somehow as a people we have failed to protect our children and community by giving a strong and firm education in Judaism and our own long and proud history. Chabad tries to help fellow Jews with outreach and some other organizations also make the effort. Chabad needs more support. Tickets range from $100 to $100,000, with the opportunity for high-paying attendees to attend a VIP reception (plus photos!) with Bush, as well as receive a signed copy of his book and passes to the brand new George W. Bush Presidential Library and Museum. It’s a surprising engagement for Bush, given his public commitment to Judaism in the past and considerable grasp of the religion. His chief of staff, Josh Bolten, told  Tablet’s Yair Rosenberg last year that the Bushes “were very open to and respectful of faiths of all kind, but particularly Judaism.” Barbara Bush would even make sure there was a vegetarian option for Bolten, who keeps kosher, starting at campaign events in 2000. 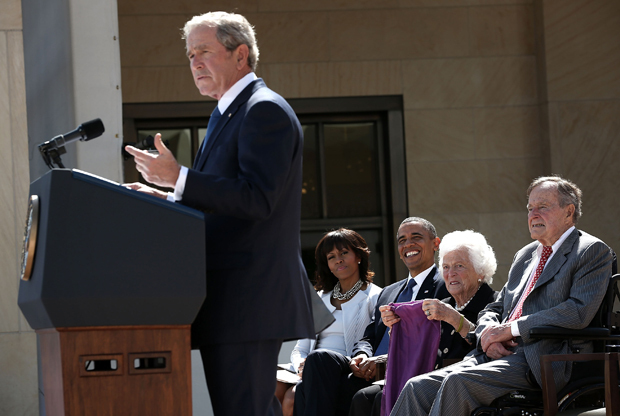 So what’s behind Bush suddenly shilling for a messianic organization? Your guess is as good as mine.